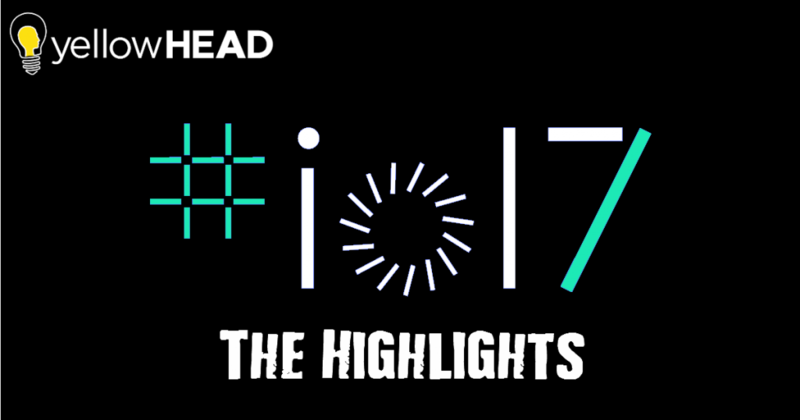 Google I/O 2017 is a huge event that took place last week on May 17-19, 2017 and gathered developers, engineers and executives from all around the world to learn about and discuss the brand new announcements we can look forward to in the year ahead. We were actively tweeting live about all the major news and updates valuable for mobile app developers. And while Google I/O 2017 is over now, the things that were announced will have a lot of impact on the future. In this article, I will summarize the highlights from the Google developer conference in case you missed our live updates. Google indicated that it is moving from mobile first to AI first, with the Android platform (the most widely used mobile platform in the world) driving that change through Google products, which are continuously becoming smarter with the integration of machine learning. Google.ai makes it possible for hundreds of thousands of developers to utilize machine learning with TensorFlow (an open source library for machine learning). Now, this artificial intelligence will no longer live only on cloud. Google wants to bring a mobile-optimized version to your next phone with an AI-optimized chip in it “sometime in the future”. At the Google I/O Keynote, Google kicked off the Android’s O beta release. Improvement in battery life by limiting the number of processes that apps can perform in the background while multiple apps are running. Picture-in-Picture feature that will allow users to keep the active app running in the small window when they suddenly need to open another app. Smart text selection feature is a great update that will improve usability for copying specific parts of the text. It will know how the select all the text (e.g. if it’s an address) and will perform an action with a single tap (e.g. show you directions). Autofill will make it easier to fill in your info automatically across apps and the web. Google Play continues to grow rapidly around the world, with more and more developers building high-quality and engaging app experiences on the Android platform. People in a variety of roles at app and gaming companies, large and small, perform different actions in the Google Play Console. And the fact that a lot of console users are not developers, led to the name change from “The Google Play Developers Console” to “The Play Console”. The Play Console now offers app performance metrics (stability, battery usage and render time), release and pre-release management tools, user acquisition and financial reports, and user feedback. Look out for another blog post coming up with extra juicy details on the new Play Console features! Google Lens is the newest product from Google that’s coming to your phone, with the purpose of recognizing and providing info on the surroundings. It’s a set of vision-based computing capabilities that can understand what you’re looking at and take actions based on that information. All you have to do is point your phone’s camera at the object and it will bring up relevant information, whether it’s recognizing what the object is, extracting text information such as phone numbers and Wi-Fi router passwords, or giving you a restaurant’s address and ratings by seeing the name sign. So here’s the problem that everyone faces except Apple: a lot of people use iPhones. We’re talking about 1B+ devices. And iPhone has Siri right there in the Home button. How can you compete with that when you ask users to download an app, log into it, and then go find the right icon every time you want to use your assistant? We will see shortly, as Google is now trying to compete with Siri by launching the Assistant app, which will have the same functionality as it has on Android, with one nice new tweak: you can communicate with the Assistant by either talking or typing. Texting with your Assistant can be more convenient when you are in a situation in which you cannot talk out loud (e.g. in a meeting). This app has already come out in the US. In addition, Google is making the Assistant SDK available to 3rd party hardware developers. That means a broad adoption of devices that will understand you better. Hands-free calling is coming to Google Home and the device will become available in Canada, Australia, France, Germany and Japan this summer. It will also offer Spotify’s free service. Google has also made an important change to the way Google Home communicates with the introduction of “proactive” notifications. Now, Google Home does not need to simply wait for your input. If it has something to tell you (e.g. it’s going to rain and you should take your umbrella, there’s traffic building up on the way to your meeting destination, etc. ), the device’s lights will turn on and the notification will be triggered by your saying, “Hey Google, what’s up?”. HTC Vive and Lenovo are developing standalone Daydream VR headsets powered by Google. This headset has everything you need built-in the device, so no need for a phone. All the necessary hardware is bundled in a single device. This pretty much wraps up all the major announcements Google made during Google I/O. Other than the new Play Console features which we will expand on in a separate post, also keep a look-out on our blog for insights from Google on boosting user retention. To stay informed on all the latest news, or if you have comments to contribute, tweet us at @yellowheadinc and we’ll include your comments here!